Lindsey Gendke is the newest professor in the English department at Southwestern. Following the retirement of Dr. Judy Laue this year, Lindsey Gendke joins the English department as its new professor. In addition to teaching writing classes, Gendke is currently in charge of the Write Spot. Gendke grew to love reading and writing from a young age. Keeping a journal by her side, English was a natural choice when it came time to decide what she wanted to study in college. After Gendke graduated with a bachelor’s degree from Southwestern Adventist University in 2008, Dr. Laue encouraged her to continue her studies and she joined the master’s program in English at UTA, graduating in 2012 with a master’s degree in rhetoric and composition. She taught high school students for three years at Rio Vista High, where, according to Gendke, she faced challenges, grew, and learned that she enjoys teaching, just not at a high school level. 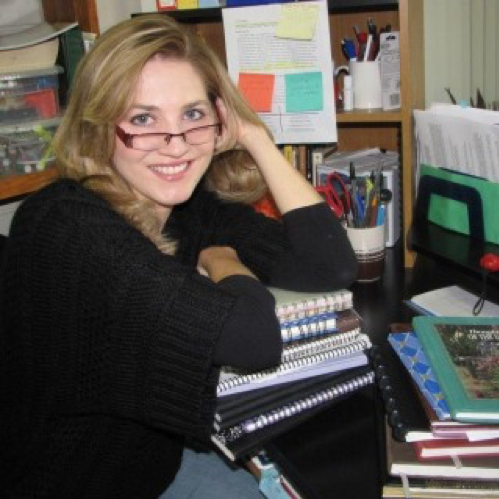 After gaining her master’s degree, she decided that she wanted to pursue writing and has since written three books. The book that she finds the most precious to her is entitled Ending Pain: A True Story of Overcoming Depression, published by Pacific Press in 2016. She had a story that she wanted to share but could not do so at the time that everything was occurring. Therefore, she shared her story in an autobiographical testimonial. Professor Gendke has attended women’s conferences in Florida and Iowa to share her story with other women who are also struggling. She is grateful to be able to provide help in any way that she can and feels that it is a blessing to interact with her audience. Before the book containing her story was published, she co-authored another book entitled The Hidden Half of the Gospel in 2014 with Pastor Paul Coneff. Coneff oversees Straight to the Heart Ministry in which they help people realize that Jesus’ suffering heals ours. Gendke was going through his prayer training when he mentioned that he wanted to write a book but needed help to do so. The third book that she has written deals with the topic of anger and is due to be published soon. In 2013, Professor Gendke taught at Southwestern as an adjunct professor and is now glad to be back full time. She feels it is an honor to be in the department where she learned from professors such as Dr. Judy Laue and Dr. Renard Doneskey. It was always a dream of hers to come back as a professor and that dream has now been fulfilled.